"This is a historical narrative of supposed demonic possession, religious fanaticism, sexual repression and mass hysteria that occurred in 17 century France surrounding unexplained events that took place in the small town of Loudun. The priest arrives in town and promptly gets off side with everyone, he's self centered , arrogant gets one local girl pregnant then denies any involvement. He next seducers another woman and manages to convince her that he has the power to marry them and puts her through a mock ceremony. Naturally the locals don't take too kindly to this and from then on he is a marked man. He not only has to deal with the locals but he has also upset many movers and shakers in Paris. The head of the local convent Soeur (Sister) Jeanne become infatuated with him and after he rejects her sexually and refuses to become the convents spiritual adviser she to sets out to destroy him. The seventeen nuns at the convent become over taken with a mass hysteria where they are allegedly possessed by various demons. The priest is blamed for this. The church sends in exorcists rid the nuns of these demons. This is all an amazing stitch up of the priest, who although he is everything that a priest should not be he hasn't infected these women with demons. Eventually after years of "evidence" being gathered to use against him and the most horrific torture Grandier is burnt at the stake. The ignorance of all concerned is fascinating, it shows the farce that religion is and even though this was 500 years ago it is still staggering what people believed. Huxley manages to explain well the physical filth that people lived in these times. One of the priests concerned in gathering evidence to convict Grandier slept in his clothes for 20 years and explains how it took him several hours to remove his shirt which he changed once a week. There is a lot more to this than I've said here. Huxley used many sources as material including an autobiography written by Soeur Jeanne herself and several other contemporary accounts. 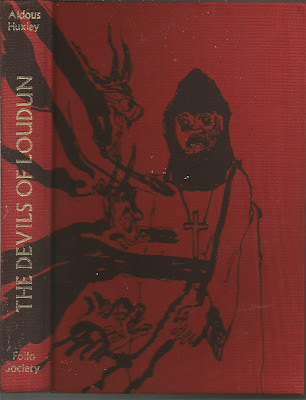 This is the book that Kens Russel's film "The Devils " is based on. I've seen the film and many said it was over the top. After reading this I think Russell was remarkably restrained in his treatment.